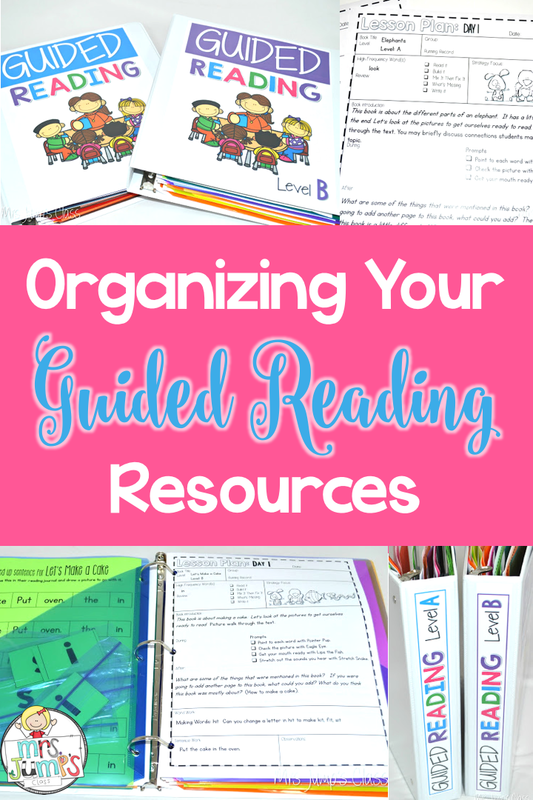 Getting organized for guided reading can be a challenge. In order for it to be effective, you need to keep your resources handy and all together. So I like to keep my guided reading books and lessons together in individual binders. Each binder is organized by level. and having the spine labeled helps to find the resource I need in seconds! Inside the binder is where a disaster can happen if you are not mindful! Right inside the cover is where I put the sound boxes. I slide them into a sheet protector so students can write on them with a dry erase marker. As students progress to higher levels, they will have experiences with 3-4 phoneme words. For Levels A & B students will simply work with 2 phoneme words. Inside, I have placed 6 pocket dividers. I have labeled each of the pocket dividers with the name of the text. Each set comes with 3 fiction and 3 non-fiction texts. Each level also has a black and white option. As I turn the page, the back part of the pocket (the right side) houses the sentence work and any word work materials that will go with that book. On the left are the lesson plans for day 1, lesson plans for day 2, and the running record recording pages. Here is an example of the 2 day lesson plan for Elephants (from Level Text Set A). Here is an example of the running record. You will notice we added a table so you can easily determine their accuracy rate without having to do BIG MATH! Ha! Why do you have a 2 Day lesson plan? By having a 2 day lesson plan, students are given an opportunity to engage more with the text. On the second day of the lessons, students should demonstrate fluency with the text. Additionally, the second day offers the chance to revisit the sight word from the previous lesson and it allows for guided writing. DAY 1: The students will unscramble, read, and illustrate the mixed up sentence. Day 2: The students will use that sentence to write their own. One word will be a word of their choice. Invented spelling is perfectly acceptable. However, since the words look, at, and her are provided, those should be written conventionally. This also gives you an opportunity to discuss print concepts and build positive writing habits from the start. These books were written with the Fountas and Pinnell guidelines in mind. How many levels do you plan to make? We are committed to creating sets through level G… but we may go as high as level L. It is our plan to have these completed before the start of the next school year. Will you bundle these sets? This was a hard decision for Deedee and I. However, we have decided to not bundle them yet because we are not sure how high we will create them. Don’t fret! We want to reassure you… We will post each level at a 25% discount for the first 7 days. This will exceed the discount you would have received with the bundle. You can find these leveled sets by clicking on the picture below. Enter your information below to sign up to receive a FREE Guided Reading resource! Do you know that binary options remain cash-settled like the European-style trades? This simply means that binary options daily can be practiced on the expiration date. In case the options settle in the money at expiration, then the seller or buyer of the trades will receive a pre-specified dollar equivalent. Thank you so much for sharing this! What size binders do you use to store each of the levels? I was wondering the same thing! 2 inch?? Yes! A 2″ binder would work! Always excited to see your new work! Excited!! I WOULD LOVE TO RECEIVE THE GUIDED READING RESOURCES! Are the FREE Guided Reading resource still available?